SUNRISE, FL, October 26, 2017 (PRESS RELEASE JET) – The Florida Panthers announced today their Halloween-themed “Fear the Territory Night” presented by IT’SUGAR will take place on Saturday, Oct. 28 at BB&T Center during the Panthers 7 P.M. match-up with the Detroit Red Wings. 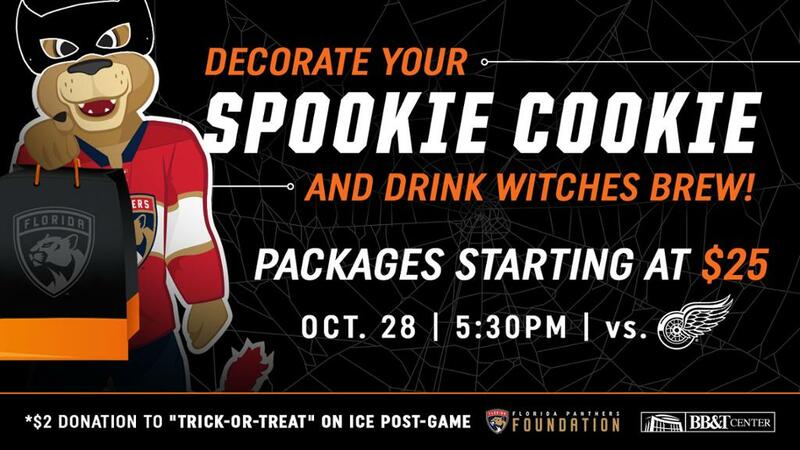 Fans and families can take part in “Spookie Cookie Night” by decorating Halloween cookies and drinking “Witches Brew” apple cider before the game at 5:30 P.M. To participate in this event, fans must purchase through the exclusive link here: FloridaPanthers.com/SpecialTicketOffers. Following the game, fans can take part in trick-or-treating on the ice. A $2 donation fee (cash only) is required to participate in the trick-or-treat session with all proceeds going towards the Florida Panthers Foundation. Candy for the trick-or-treat was donated by the night’s presenting sponsor, IT’SUGAR. This is Panthers Territory. We unite on Oct. 26 when the Panthers host the Anaheim Ducks (7:30 P.M.) Join our territory with a game plan to enjoy discounts off of single game pricing, monthly payment plans options and priority access to Stanley Cup playoff tickets at BB&T Center. Contact us to learn more about single game suites and group information. Please call (954) 835 – PUCK (7825) or visit FloridaPanthers.com/TicketCentral for more information.